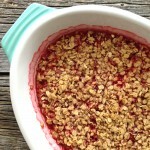 In an oven proof dish, combine the strawberries, rhubarb, sugar, and water/or juice. In a separate bowl, combine flour, oats, salt, sugar and butter. Then spread oat mix on top of your fruit. Let rest. I think it’s best served after it has sat for about 30 minutes to an hour.